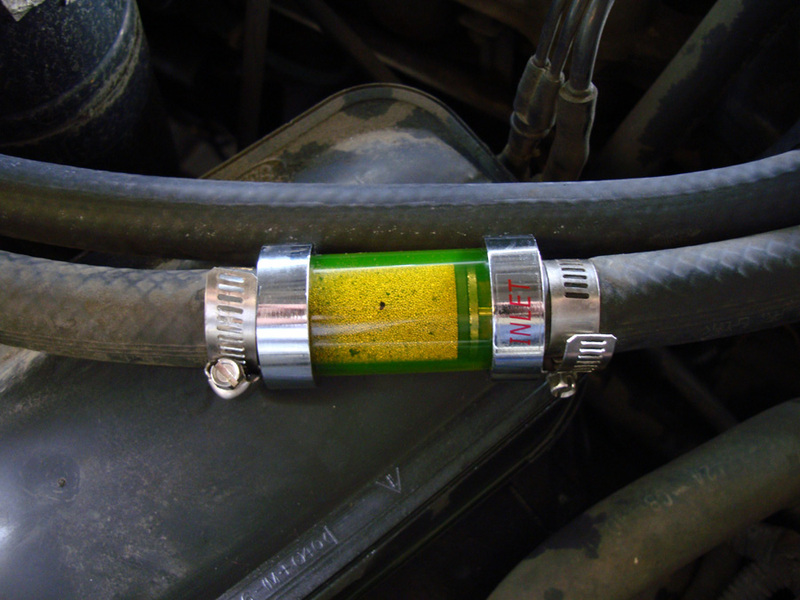 Installs easily into your heater core inlet hose. As the coolant flows through this filter it removes the microscopic metal particles and it also has a magnet incorporated into it to help attract these particles. The filter also helps in reducing cooling system surge (surge and normal flow pressure can range from 10 to 50 lbs). The most vulnerable to surge pressure and contamination are aluminum constructed components such as water pumps, heater cores and radiators which typically fail prematurely due to contamination issues. Clear glass filter housing construction provides viewing of the filter, magnet and coolant condition. This filter is easily cleaned by reverse flushing. 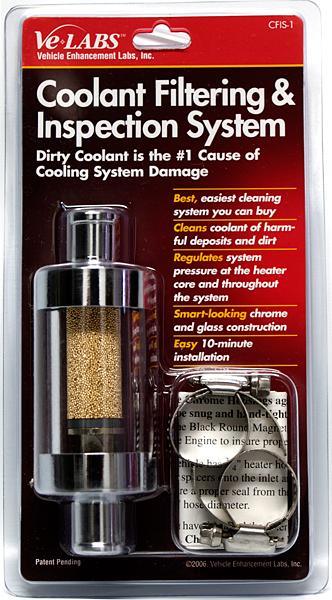 You must install the coolant filter in the inlet hose which flows coolant into the heater. The inlet hose is the hose that comes from the intake manifold or the side of the engine block (If your vehicle has a heater valve it would be that hose). The return hose is the hose that goes to the water pump or to the radiator. Once you have determined what hose is the inlet you need to cut out a section of the hose the same length of the filter. If the hose you cut is 3/4 inch you need to use the hose adaptor that is supplied with the kit. If the hose is 5/8 inch you will need to remove the adapters. There is a sticker on one end of the filter that says “inlet”; the coolant comes from the engine into the inlet of the filter and out to the heater. Slide the hose clamps onto the end of the hose and push the filter into the hose. Tighten the hose clamps. Start the vehicle and let the filter fill with coolant and let it warm up. Pressure-check the system to ensure there are no leaks (On rare occasions the filter will leak at the rubber seal between the glass and the chrome end cap and if this happens grab the chrome end caps and twist to tighten. This will stop the leak). If the vehicle has duel heaters do not install the filter as it will not allow enough coolant for both heaters to work properly.